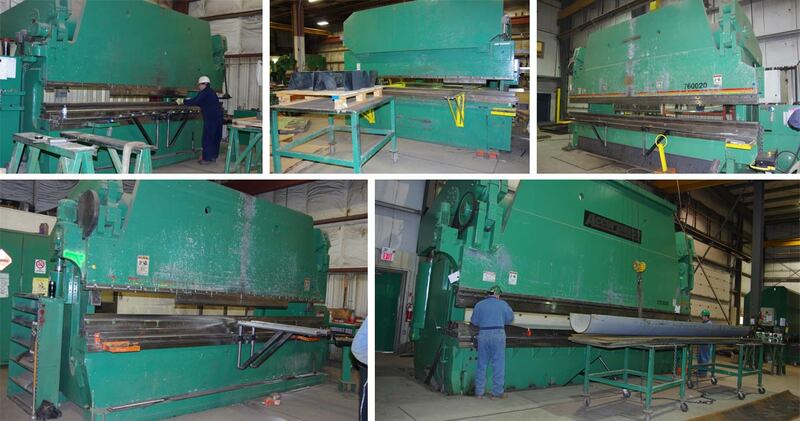 A hydraulic press brake is a forming machine. They are described by the maximum tonnage they can produce and the maximum length of the part that can fit on the bed. Hydraulic rams produce the forces required to move an upper die into a lower die in order to accurately form carbon steel, stainless steel, aluminum, copper, and various other types of metal. A variety of standard dies are available but special custom dies for corrugations and v-rib profiles make custom projects more cost effective. The forces required depend on various factors such as material type, material thickness, and the actual length of the part. Penetration of the upper die can be controlled with accuracy up to 1/1000”. With all the technology available in today’s modern brakes, the operator is still the key to a quality product. We are fortunate to have equipment operators with years of experience that can handle the tough projects our customers challenge them with.